It is lovely and congratulations on the publication! I reminds me of summer. AHHHHHH - that's so exciting! And i'm so glad I started getting that magazine last month! I'll be stalking the mailbox. VERY COOL QUILT! I may be tempted to make something that huge! I am so proud of you! Oh, I hope that does not sound weird. Congratulations! I am definitely going to be getting that magazine. I am already picking out fabrics in my head to make the pattern with. Congrats, that's amazing. But I'm not sure any of us are suprised, you are greatly talented. Julie! I am so happy for You! Congratulations! What a beautiful quilt! I will be sure to buy that issue. Congratulations! I really like the graphic nature and the soft blending of the blues and yellows! Love it! You must be walking on air! Congratulations! 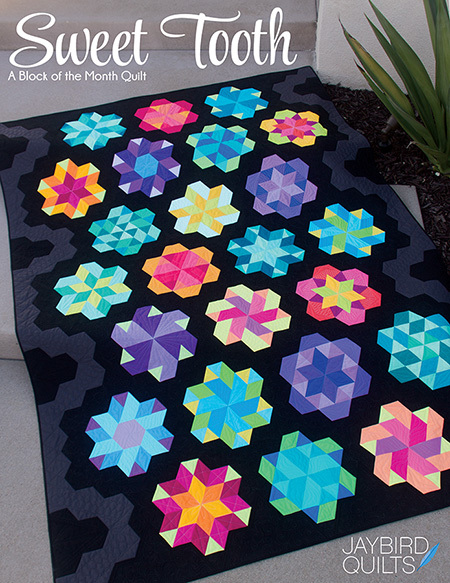 Your quilt is beautiful and i love the colors! Way to go!!! Woo-HOOO!!!!!! It's lovely Julie... :) The first of many I'm sure! Beautiful! I will be excited to see it in my magazine. That's a beautiful quilt - congratulations! congratulations! 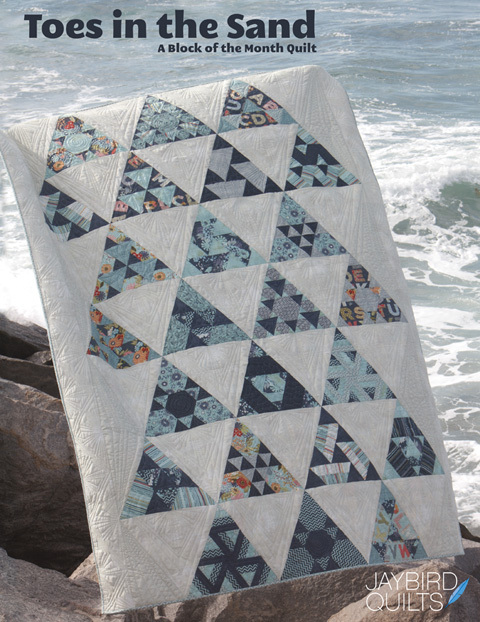 Love the striking design of this quilt. What a fabulous achievement! wow! many congrats to you!!! the quilt is beautiful! Oh Julie!! I'm so happy for you - congratulations!!!! You truly deserve it - you've been working so hard this last year (at least as long as I've been reading your blog - I'm sure you've been working hard for more than a year!!) This is just the start for you! Yippee!! 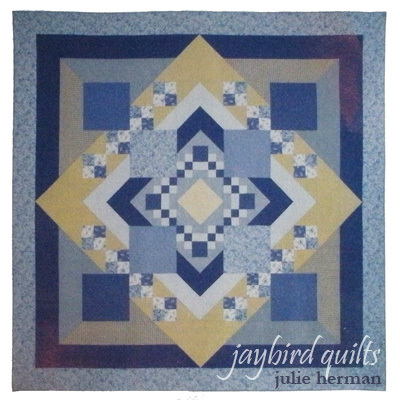 Go Jaybird Quilts!! Will your copies in your ETSY shop be autographed?? One more thing - don't forget all us little people now that you're famous!! LOL! congratulations, that must be so exciting. AWESOME! I am so getting an autographed copy of the mag! Way to go! Congratulations! How exciting! I hope you find a fun way to celebrate being famous! Congrats!!!! That is so wonderful for you!!! congratulations! that is so exciting, and I will definitely buy a copy when it comes out! Congratulations, Julie! How exciting! The quilt is gorgeous! Congrats! 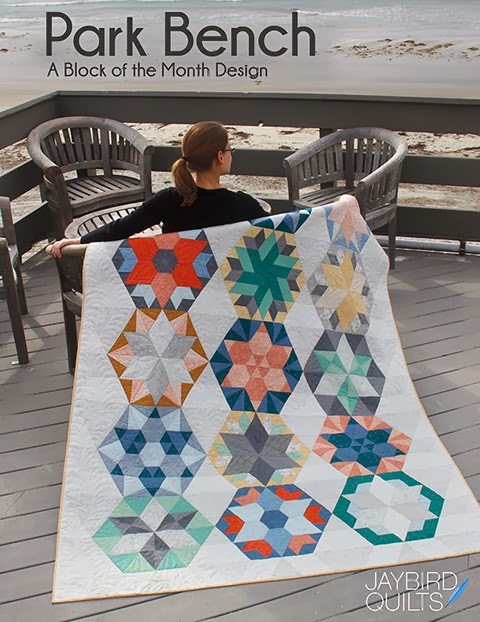 What an accomplishment--to make a gorgeous quilt AND have it published. Congrats! She's a beaut! Well done! Congrats Julie!! That is fantastic! Congratulations. It's a beautiful quilt. I love the story about your creative process, and the big rush. Congrats, Julie! So, so exciting!! 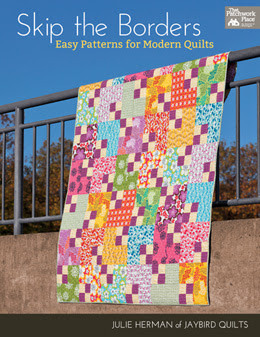 And what a gorgeous, springy quilt! Super duper congrats! 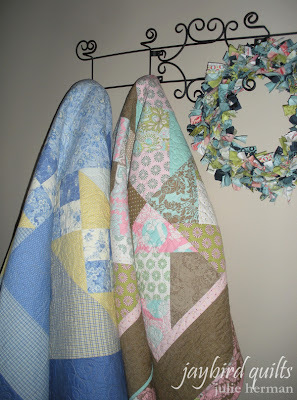 I think this quilt is EASLY going to be a Quiltmaker all-time favorite! I can't wait for the All-Time Fav issue comes out, and I can say, "SEE... I told you so!". Congrats!!! That is a beautiful quilt!!! Girl, you have some mad skills!! I found your blog not to long ago and realy enjoy stopping by. I'm in Rachel's siggy swap and I look forward to recieving your swap along with everyone else's. 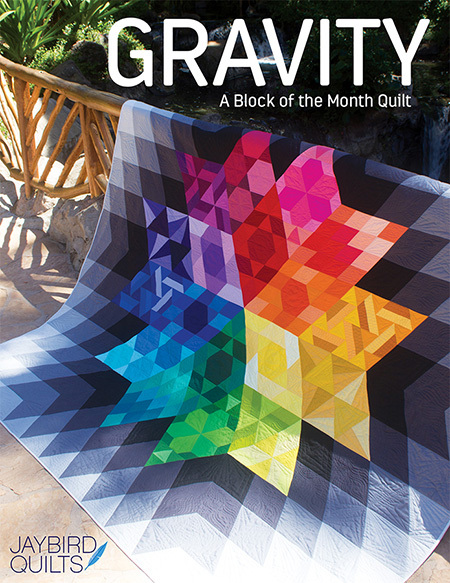 I'm a beginner quilter and would like to know your opinion on the best quilting mag. 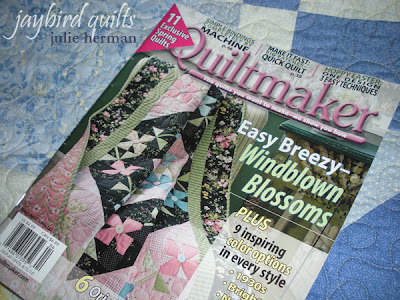 Is the Quiltmaker mag a good one to start with for a beginner? Thanks for you help. Congrats. That is so awesome. And a beautiful quilt. Congrats!That's wonderful. 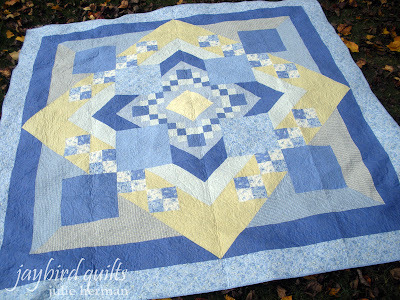 Love the quilt; it's gorgeous! I am so happy for you. I am glad it is finally published I know how hard it has been for you to keep this secret. I knew there was good reason to marry into your family. u made me cry tears of Joy this morning, it is such a wonderful feeling for a Mom to see her daughter "shine". Today I call u "STAR shine" instead of sunshine:) I love u so much. Such a memorable day for you to treasure. Soak up the glory, it is so well deserved!! ...and from the other side of the Nation...the same sentiment from me...it IS your time to shine...sit back and SMILE!! Natalie. No, really. BIG smile. Really. How very exciting! The quilt is beautiful! Congratulations! So cool and very exciting. I am not sure how you kept it quite for so long. It is very pretty. That is exciting news! It looks like they photographed it beautifully! Congratulations-----next we will see your name on the selvage edge of fabric. Keep the ideas coming. Congrats Julie--I'm so glad we met you. It's fun to read your excitement about being published and how excited your family and friends are for you too! I know this is a biased answer ;-) but we work hard at Quiltmaker to include quilts for all skill levels, including beginners. We want our patterns to be very approachable. 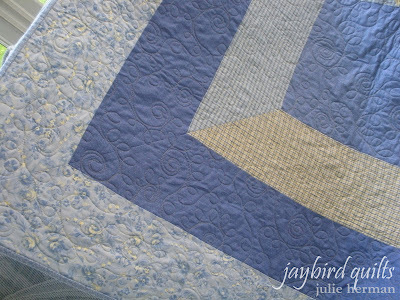 For example, in Julie's design our editors spent a lot of time making sure of the best way to explain the yellow triangles that extend into the borders. I hope you give us a try! Congrats! That is so incredible that you got into a magazine. I will have to see if I can get the magazine here in Ireland. I am so delighted that you have used my Nature's Notebook fabrics for your quilt. It is delicious. A confection of devon cream and powder blues. Bien Fait! 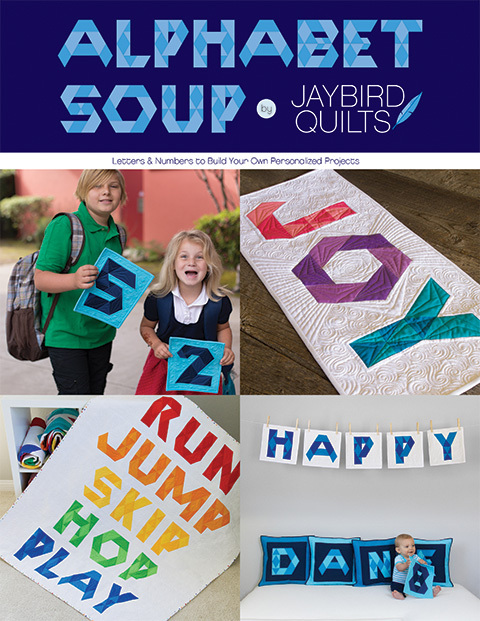 Congratulations on being published Jaybird! Gorgeous!!! I love the colors and bold shapes! I bet your more happy for 75 comments iol I totally would be. Congrats for being there!!! !, you're a talented girl! 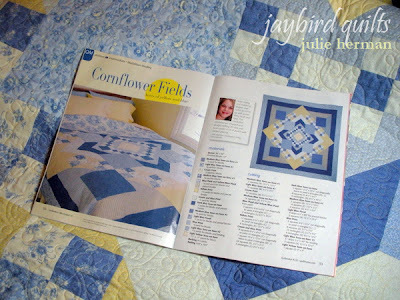 I just got my Quiltmaker Mag...woo hoo, I know someone famous! Jane StP, one of your CA fans.